Nov. 30, 2004: Who Is Ken Jennings? 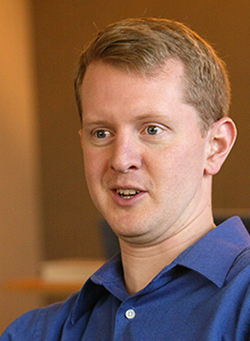 2004: Ken Jennings, the longest-reigning Jeopardy! champion and one of the biggest money winners in game-show history, meets his Waterloo. Jennings, who strove to remain a gracious winner and a nice guy as his streak grew, acknowledged that while intelligence and having a quick hand on the buzzer played a part in his success, his biggest asset was simply a wide reservoir of general knowledge. Still, he wasn’t comparing himself to Einstein. In some ways, the hardest part of his long run wasn’t winning the games themselves, but maintaining silence from the time the show was taped until it aired. His defeat, for example, was actually taped in early September, almost three months before the Jeopardy! television audience, which grew by 22 percent during Jennings’ run, would see it. Brad Rutter defeated Jennings in the Jeopardy!Ultimate Tournament of Champions in 2005 and surpassed his Jeopardy! dollar total, even though Jennings won additional prize money in various Jeopardy! tournaments. Jennings came in second and Rutter third against IBM’s Watson computer in a two-game match in 2011. This article first appeared on Wired.com Nov. 30, 2007.